Jessica Liu (left) and members of SALT II in Lindsey Matheis' Chimera. Photo by Kylee Gubler. 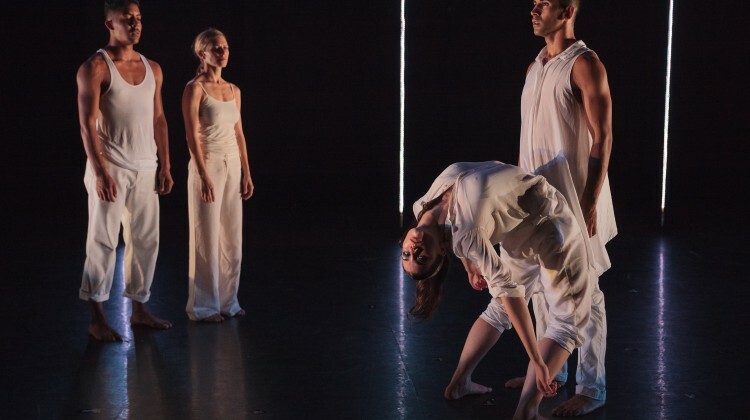 SALT II, the junior company of SALT Contemporary Dance, had its first full length show at the Leona Wagner Black Box this past weekend. It showcased thirteen strong female dancers that approached the program’s seven works with artistry and technical skill. The lights brighten to a soundless scape of several couples buttressing up against one another, shoulders to chins and chins to shoulders. This symbiotic relationship eventually gives way to more conflicted ones in local dancer and choreographer Eldon Johnson’s The Truth Of The Matter Is. Structurally this piece vacillates between animal-like movements, the spine continually experiencing a tickle that can’t be scratched, and brief moments of stillness, the dancers forming human still-lifes that are framed against a red cyc. The large cast number settles into a duet with dancers Haleigh Larmer and Morgan Phillips that features innovative partnering that could be categorized as the great-granddaughter of contact improvisation and a cousin to contemporary ballet. It incorporates the idea that ‘any body part can be a support structure’ paired with clear and clean lines splicing and undulating through the space. Jessica Liu multitasks as dancer, SALT II assistant director, and choreographer of Preserved Peals, and shines in this duet with guest artist Ismael Arrieta. This piece starts with an upbeat song by Bahamas and a hit-hit-gesture rhythm. Liu is that rare dancer that showcases beautiful lines with grounded strength, and attention to detail while gobbling up the space. In this piece she manages to do all this while exuding a believable joy and feel-good happiness. It’s believable in part because I cannot doubt it would feel amazing to dance that well. Arrieta does his part in keeping up with Liu, and displays his own brand of laidback California cool. The work has a middle section of weight, release, and rest, but does not dwell there, instead quickly returning to high wattage, sparkling movement. The dancers end by sprinting offstage. Deditionem by Mady Beighley, Dust Seeds Clouds by Gabrielle Lamb and Tracing the Steps You Left Behind by Jason Parsons were well-investigated and deserving of singular attention, but suffered because they were all full-cast pieces positioned one after another and drew on similar movement sensibilities. The inclusion of a sock-induced slide is one of those sensibilities, (are bare feet bygones of yesterday?) and while this move worked well in Preserved Peals (because it had the fun and frolic of a Tom Cruise in Risky Business moment), it felt contrived in the other pieces. The slight Pina Baush Rite of Spring-feel to Deditionem, complete with Hayley Smihula as the sacrifice in white. The movie-esque score by Johann Johannsson helps elevate the drama and crystalize the stakes. 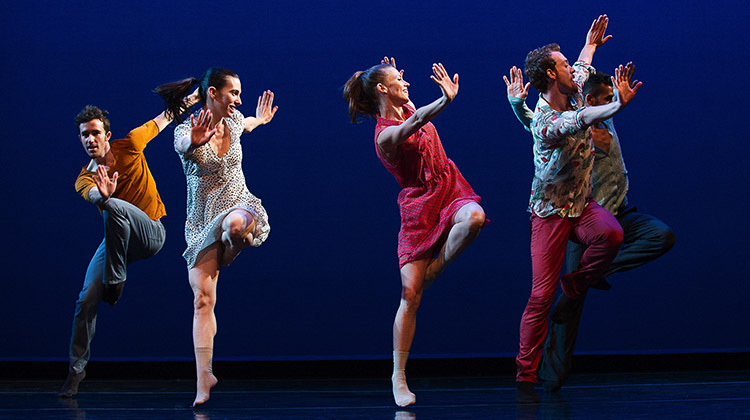 Lamb’s piece uses the instantly recognizable music of Zoe Keating, which is just waiting to be used in concert dance again and again and again as it so clearly provides a dynamic structure and rich texture with which to base movement off. The score drives and fills and emotes urgency and modern-day drama. That being said, the choreography of this work has its own two legs, and ends with a beautiful solo by Lauren Bonan while the rest of the cast bears witness upstage. This was the second time I watched SALT II perform Tracing The Steps You Left Behind, and this showing felt more distilled and seasoned than the first. Amy Falls reviewed the first showing, and while much stays the same, the unfocused walking seems to have been replaced with a simmering undercurrent of control and predator/prey relationship. A welcomed departure was Joni McDonald’s solo for McKenna Chugg. While it did not take pains to explore theme or variation, it was refreshing in terms of costume (a bright red leotard), showcased a single dancer in the space, and ended abruptly. The evening concluded with BODYTRAFFIC dancer Lindsey Matheis’ Chimera, and after reading that a chimera is a single organism composed of cells from different zygotes (in other words, one thing can in fact be many things combined), this piece is appropriately titled. The work begins like Johnny Depp in Charlie and the Chocolate Factory, full of mischievous wonder and magic, and ends as Depp in the snow scene from Edward Scissorhands, dancers bathed in white, both sculptural and yearning in the space. In my wildest fantasy, guest artist Logan McGill would not be the only male and the one gifted the role of puppeteer in Chimera. He sauntered around the cast of women, controlling them with his gaze and movements, even at one point leading out two crawling ladies as if they were animals on leashes; but this is Matheis’ world, not mine. Despite this grievance, Chimera is an interesting, even spell-binding piece that has lingering theatricality and an unpredictability that has stayed with me long after the lights went dark. Erica Womack is a choreographer based in Salt Lake. She is also an adjunct faculty member at SLCC.